Week 48: Pop ups shop and making stock. This week all our groups made a big effort to produce stock to sell in the pop up shop. The shop is a collaboration between Space2Create, Creative Arts and South Lakeland Mind. The aims are to raise awareness of each organisation, raise funds and give purpose to the crafting and making of the groups. This will run till at least Christmas and maybe beyond. The opening of the shop is at 11am on the 1st Of December upstairs in the Westmorland Shopping Centre, Kendal. We are also starting to plan ahead for our open studio weekend with all the other artists at the Factory. On December 13th and 14th all the studios will be open with artists work on show and with the artists at work in their studios. 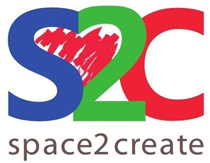 Space2Create will be no different with us open and at work on creative activities. On the ward, we were again in festive mood, experimenting with decorations for Christmas-themed tags. We used basic thin tag shapes as templates, cut around them and then attached them to cards and papers of varying other colours and …thicknesses, to make them more decorative and individual. We then used various art and recycled supplies together with stencilling to embellish the tags further. Seasonally enough, the odd decorated star even made an appearance, in what proved a very productive and enjoyable session. There was a mixed bag of activity with one person making handmade Christmas Cards, another sowing an installation and one person creating comic art. Most of the group were making bird feeders. They were threading peanuts onto wire, sh…aping them into different arrangements and then tidying up the ends with Rafia. They were also decorated with bows for the festive season These are intended for sale in the pop up shop in the Westmorland Shopping centre in collaboration with Creative Arts and South Lakeland Mind. The group used a style from a piece of art work by JimDogArt. Using complicated tangles, blocks of colour and black outlines. The group drew in pencil thiier design, then painted them with acrylics in blocks of colour. Finally they started to outline the images in black pen but tried to add thickness and round corners off to give a feel of more depth to the image. This week has seen a bit of a production drive as we prepare things to go to the Mayors Christmas Coffee Morning and also to a pop up shop collaboration. We are working with Creative Arts and South Lakeland Mind to run a pop up shop in the Westmorland shopping centre to promote all three organisations. Handmade creative and art items will be there to see or make donations for. The shop opens from this week with the official opening at 11am on Monday 1st December. There have been some really good creative sessions this week in Studio 31 with people making good use of the new fascilities to explore their ideas and create work. Having our own place has meant people are more willing to undertake projects over a longer time as we don’t need to clear it all away! The session was a mixed bag as people finished off their frames from last week, some made items for the pop up shop and others did their own thing! It was a really busy session with lots of creating going on. Some great ideas for cards and decorations. Some of the frames are nearly done and ready to hang up. On Kentmere Ward, we experimented with modroc shapes, many of which eventually acquired some Christmas theme or use. As in the Studio sessions, we wrapped and moulded modroc around tinfoil and masking tape shapes to create objects loo…king like (for example) presents and snowmen or birds and rabbits, most of which were designed to hang from a festive tree. One participant even managed to paint his gift shape in the time available, creating a fantastic decoration in the process. During the creative process, participants discussed the memories associated with their shapes, from Christmas Day routines to children’s television characters, in what proved to be a very lively and engaging session. A very productive session today as everyone was making items to sell in the Pop up shop collaboration between Space2Create, Creative Arts and South Lakeland Mind. Some lovely cards were crafted and tree decorations. Others worked on their own textile projects, a sheep and some work for an art installation. Today in 2Create we started making items to go in a pop up shop in the Westmorland Shopping Centre as part of a collaboration with Creative Arts and South Lakeland Mind. We were making cards and some quirky Christmas tree decorations from wire, beads and odd bits. This week we started getting sorted more. The hanging system turned up so we can start putting up the rails ready to hang our first exhibition. We carried on with the poppy them too. Some poppies commemorating each soldier from South Lakeland who was killed in the First World War created by a group from the Comic Art Festival inspired our clay ones based on the Tower of London poppies. We are now getting ready for our opening day event 10-3 on Saturday 8th November. On the ward, we began by decorating small cakes with poppies, rolled out and shaped from pieces of coloured icing. We then progressed on to creating more decorated lettering using a variety of media, which all participants thoroughly enjoyed. The atmosphere was informal and fun, with plenty of ideas generated for future sessions. In this weeks session, there was the usual mix of interesting activities. Some participants worked on hand-made fabric sewing kits; others needle felted, whilst some carried on with the miniature houses and one participant drew. The sessions are always inspiring, as there is so much being created and so much talent on show, as well as so many ideas for future activities. In the session, there was a lovely mix of creativity. Some people continued to make clay poppies, whilst others painted the dried ones made last week. Some participants drew and painted; others created collages of their feelings around S2C, and one participant even hand sewed tiny mice. It was wonderful to see so many people in our new space!